Ad frauds have been disturbing advertisers’ sleep since a very long time. This is causing them heavy losses, as their ad budgets go for a toss. This has created a bad reputation and trust issues for the digital advertising industry. 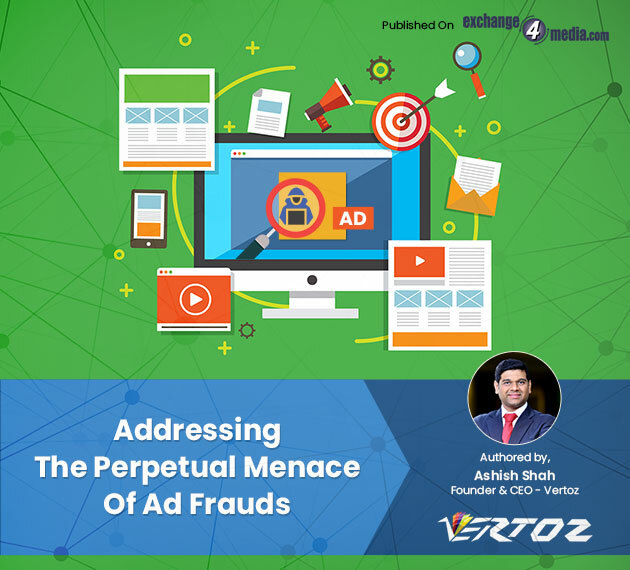 In a recent interaction with exchange4media, Ashish Shah, Founder & CEO, Vertoz, express his opinions on this pressing issue and sheds light upon some of the preventive measures advertisers can take in order to steer clear of this problem to a certain extent. He says that the arena of ad fraud is quite dynamic. Therefore, advertisers have to be constantly vigilant & updated with the technological advancements & the latest happenings in the industry, so that they can stay a step ahead of the perpetrators. Referring to two of the biggest ad frauds the industry has seen, Hyphbot and Methbot, Ashish says that the sheer scale and volume of the losses caused by these frauds is sufficient in itself to explain the gravity of this problem. Ashish goes on to explain some of the most common forms of ad frauds that brands should be aware of so that they can avoid them. These include methods like Click farms, Hiding ads/Ad stacking, Ad injection, Cookie stuffing, and Domain spoofing. However, there are certain ways, measures and practices that advertisers should observe in order to shield themselves from this problem. To know what these ways are, read the entire coverage here.